There are a couple of special film events in San Francisco on Tuesday, October 9th (tonight). The Mill Valley Film Festival comes to the San Francisco Art Institute with a screening at 7:30 pm of Welcome to Nollywood. The documentary looks at the film industry in Nigeria which only started in the early 90s, but is already the third largest behind Hollywood and Bollywood. Director Jaimie Meltzer (Off the Charts) and producer Henry Rosenthal (The Devil and Daniel Johnson) both live in San Francisco. Michael Fox interviewed Meltzer for SF360. The Orchestra of Piazza Vittorio screens at the Clay Theater at 7:30 followed by a performance by the group and Q&A with filmmaker Agostino Ferrente. The documentary tells story of an effort to save a historic theater by creating an orchestra made up of musicians from all over the world. The tour is being presented by Netflix's Red Envelope Entertainment. The Sierra Leone Refugee All Stars airs on PBS tonight as part of POV. In San Francisco, it will be on KQED at 10 pm (check local listings - it may air another night or repeat). It also will be available on DVD and through Netflix. I saw the documentary last fall at a San Francisco Film Society screening and bought the band's wonderful CD (they are touring). Also tonight on most PBS stations and online later this week is the last episode of this season of Frontline/World (though they will be posting a new story or photo essay each week this summer - subscribe to the newsletter to get updates). The best musical (and one of the best movies) I saw last year, Colma: the Musical, opens Friday in San Francisco. There will be Q&As at the Embarcadero with director Richard Wong, screenwriter and star H.P. Mendoza, and other cast members at the 7:30 pm and 10 pm shows on Friday, June 22 and Saturday, June 23rd. There will also be a party Friday at Frisson. Update: Richard Wong will be at the 7:30 pm & 10 pm shows on Friday, June 29th & Saturday June, 30th. It will be opening in New York City on July 6th at The Quad Cinemas at 34 W. 13th St and in LA in August. Hopefully, it will be the sleeper indie hit of the summer (they already have an ad promoting repeat viewings) and expand to other cities. They are promoting Colma on myspace with profiles of characters from the film including Maribel, Billy, and Rodel (HP Mendoza who also has a profile plays him). The film is also a new, shorter cut which Wong and Mendoza talk about in this interview. 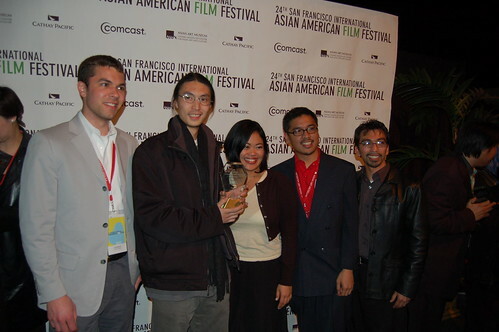 More photos from the premiere at the 2006 San Francisco International Film Festival where it won a special jury award (they did the trailer for this year's fest). RIchard Wong was also a finalist for the Independent Spirit Someone to Watch Award. 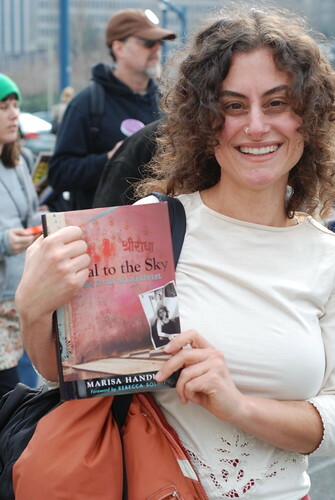 When I was briefly introduced to Marisa Handler by Chris Cook at the January 27th anti-war march, she had just received a copy of her first book, Loyal to the Sky: Notes from an Activist. She's been on a tour for the book and will be in the bay area over the next couple of days before heading to Seattle (, Portland, and LA. She'll have a conversation with Rebecca Solnit (who wrote the foreward) on Thursday, March 1st at 7 pm at New College (details). On Friday, March 2nd at 7:30 pm, she'll be reading at Black Oak Books in Berkeley. A brief interview and a longer interview. Series she wrote for Salon from the 2003 Miami protests. I'd never noticed before that people can get their mail sent to City Lights.